Two signs for the price of one! 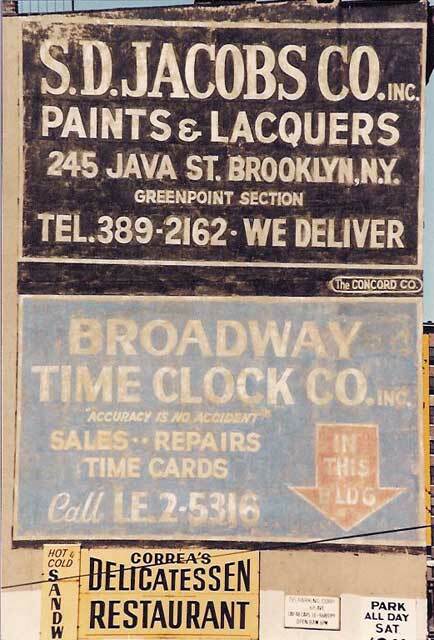 Broadway Time Clock was originally Broadway Time Clock Recording Co. dealing in the sale and repair of time clocks. They were located at 1182 Broadway in New York City in 1948. The name changed to Broadway Time Clock Co. in 1951, and they moved to the building above at 751 6th Ave (between 24th and 25th Sts.) in 1956. The telephone number LE2-5316 suggests a late 1950s to mid 1960s date for the sign. In 1989 this building was vacated and finally torn down early 1990. Broadway Time Clock moved first to 27 W. 24 St. (1990-1994 ), then to 121 W. 27 St. (1994-1999) where they were renamed Broadway Time Systems, Ltd. In 1999 this business relocated to Flushing Ave. in Maspeth, Queens. Samuel D. Jacobs opened his Paints & Lacquers store at 103 W. 24 St. in 1926, then moved just around the corner to 749 6th Ave. in 1926. (Click for ad from the Manhattan classified telephone directory (the Red Pages) in 1935.) He was 31 years old and living in the Bronx at the time of the U S Census of 1930. And he might be the Samuel D. Jacobs who appears in the Social Security Death Index as born 31 Jan 1898, died Jan 1993. The business relocated to 455 W. 28 St. in 1961, and then to 245 Java St. in Greenpoint, Brooklyn in 1966. By 1972 S. D. Jacobs had moved to Freeport on Long Island. So the Jacobs sign above must have been painted between 1966 and 1972.